Any of you out there suffering with a cold or the sinus crud that has plagued me, my family and most of North Texas, and may be taking cough medicine that has a warning label on it cautioning you not to mix with alcohol and not to operate heavy machinery, beware, we need to petition for additional labeling. I think we need an additional label "Use caution when appliquéing." Yes, it happened to me. 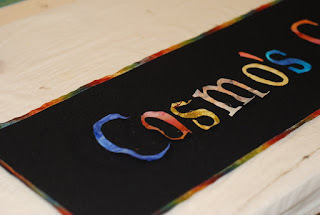 Now most of my family will tell you that my spelling has always been on the side of "creative", but my husband and my DIL both looked at the "Cosmo's Condo" sign and no one caught the extra "s" until after I was completely done and ready to hang (see Raw Edge Applique' posting and you'll see my error!). I thought something looked odd when I was ironing the letters down, but just couldn't figure out what it was...you know when you look at something so much the error is hard to pick out. Well, thank goodness the sign is raw edge appliqué. I carefully picked off the COSMS and repositioned the COSM and ironed them back down, carefully. Since I quilted the sign with black thread and it is going to be hung above eye level in the laundry room (aka Cosmo's Condo), I didn’t have to requilt any of the sign. Now, if I had put a decorative stitch or satin stitch on the sign…I would have started over completely. It’s not a big sign and picking out would take longer than making new one. I did have another incident a couple of years ago when one of my daughters' friends was having a baby girl. Val kept vacillating between the names Mia and Ava and the last Amanda Jo had heard it was going to be Ava. Well, the quilt was a name quilt and I had appliqued Ava on it, but hadn’t put the decorative stitch on it yet. I received a phone call from Amanda Jo telling me she was at the hospital visiting Val and baby Mia, yes, Mia. I told her not to sweat, that Val could change the name! Hahaha! No problem, I picked off the first two letters and replaced them with the correct letters. Mia loves her quilt and looks like a Mia, not an Ava. So my warning to all of you is, let your three year old granddaughter practice her spelling by looking at the sign before you iron it down! And, make sure the baby is here and the name is on the birth certificate before you finish the quilt! We all have to learn something new everyday!